Steven Hamley: Does Fructose Increase Uric Acid? 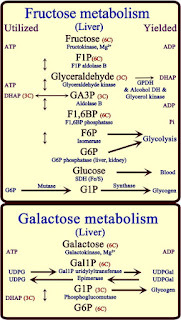 In the first few steps of glycolysis glucose is converted to fructose-1,6-bisphosphate and then gets split to DHAP and GA3P. 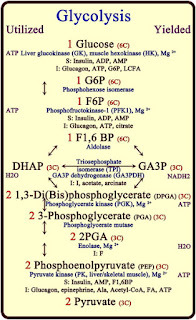 Fructose-1,6-bisphosphate has 2 phosphate groups that have been taken from ATP. So the cell actually loses 2 ATP in the first few steps of glycolysis (the preparatory phase), but gets this back and a 2 more in the later steps (the pay-off phase). 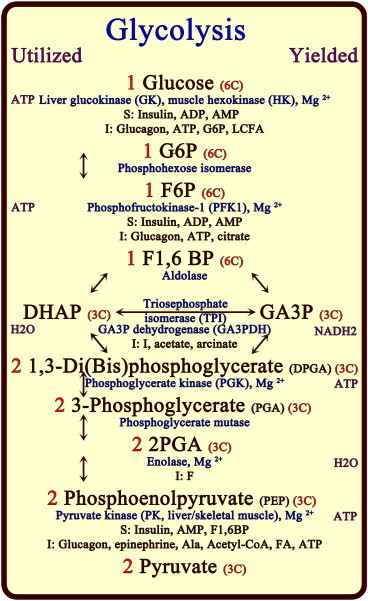 Fructolysis is very similar, it also gets 2 phosphate groups from ATP and also ends up getting split to DHAP and GA3P . 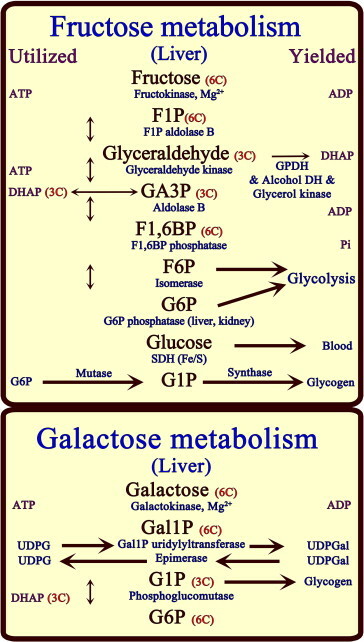 Fructolysis is similar to glycolysis (and extremely different to alcohol metabolism), but there’s a major difference – the enzymes catalysing the early steps of glycolysis where ATP is used (glucokinase and phosphofructokinase) are tightly regulated whereas the similar steps in fructolysis lack such regulation . People claiming fructose increases uric acid argue that this is the critical difference between glucose and fructose, and that high intake of fructose can deplete intracellular ATP from the early stages of fructose metabolism, turning it into AMP, which then gets broken down to uric acid  (also see Robert Lustig’s video). There were a few postprandial studies and most found that fructose modestly increased postprandial uric acid. Whether this is due to ATP depletion is uncertain as no studies looked how fructose effects postprandial uric acid and ATP simultaneously. Human research looking at this mechanism directly is quite limited , but fructose infusions (250 mg/kg over 30-60 minutes) have been used to increase ATP depletion in people with non-alcoholic steatohepatitis and healthy controls . I think the mechanism of ATP depletion is likely, but looking at the magnitude and time course of the effect, it doesn’t seem sufficient to result in pathologically high uric acid levels in healthy people and doesn’t affect fasting uric acid levels (or for most of the day) .